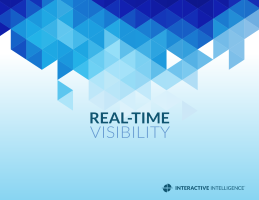 Get real-time visibility in the contact centre. See immediate benefits. Real-time visibility in the contact centre is crucial. When you do not have the info you need to make decisions, you lose out on the single best way to create a competitive advantage. Solving this issue is simple, though. With an all-in-one solution, you can get a broad and specific view of what is happening in your contact centre — and see near-instant benefits. Real-time visibility will improve decision-making, increase business agility, and boost financial result. Download this eBook to gain insight on how to get real-time visibility in the contact centre.